Where's a good, easy day out from London? St Albans that's where. A mere 25 minutes from central London and in feel, a world away. All of a sudden you are in a distinctly different part of the country with an easy going feel to it and a small town atmosphere. It has a cathedral, a large market, an old town, lots of pubs and even a small Christmas market. What's not to like? Well a persistent drizzly rain that's what. Despite leaving London with a cloudless sky, we arrived to light rain, which more or less, despite the weather forecast saying a 2% chance of precipitation, gave us 100% drizzle. As Peter Kay might say "you know, the kind of rain that wets you." I suppose too if I was a bit picky, I'd complain about the station being nowhere near the centre - and it isn't - but if it hadn't been raining that wouldn't have mattered, but as it was we were getting distinctly wet, so after a little bit of orientation we hopped into the Blacksmith's Arms for no reason other than we were passing it. It is quite a nice, friendly pub, which despite having a Cask Marque sign had by some way the poorest beer we had that day, not helped by a random looking choice of Christmas ales, plus Doom Bar. My Bath Ales Festivity was pretty underwhelming, but the pub was bustling and cheerful and the service was brisk and polite, so it was getting some things right. The food looked decent too. After a walk round the long street market, we crossed into the Old Town and made for the cathedral, noting the odd pub as we went. This being the festive season, it was carols that were the main attraction and the lovely cathedral was full of locals, anticipating their singalong, though one or two others, like us, wanted to see the building itself . That was fine too and very enjoyable. The whole church had a homely and community feel which given its size was extraordinary. It was the kind of place, if I lived locally, I'd be drawn to - and I'm not particularly religious. I'd go back in a heartbeat just to see it again. So, after that uplifting experience it was back into the rain and a quick dart into the low ceilinged Boot, which was atmospheric and rammed. We stood for our first pint and then managed a little table for two with a good view of things. It was clear the place was full of locals as folks greeted each other by name or shouted and waved across the crowded room. We were happy to be part of it and left with a lot of reluctance after a couple of decent pints, for a look round another market. 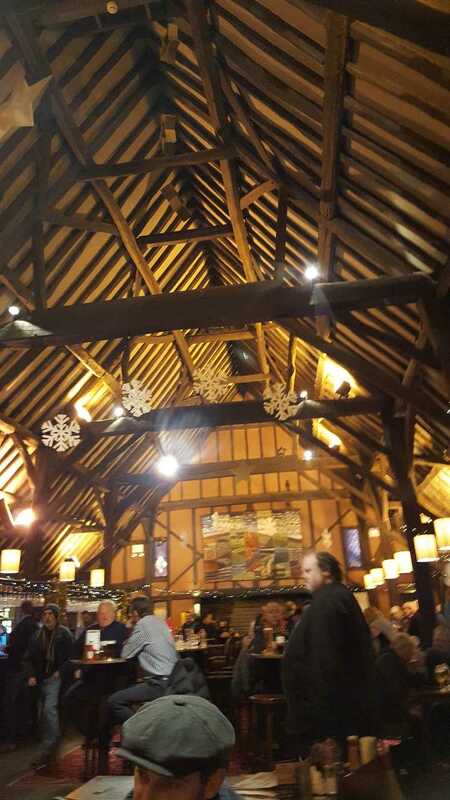 Then a stroll to the local JDW which came as highly recommended, being in a renovated medieval barn. The Waterend Barn was also, despite its size absolutely "chokka" as they say in Liverpool, so we stood at the bar with our drinks while watching the manager dish out roles to the staff, while omitting to get one or two to actually serve the growing throng of customers waiting to be served. Ah well, nearly right. It should go without saying that serving customers comes first. Well in a way, that's what happened. It went without saying. Good beer though and interesting customers in a more upmarket Christmas jumper sort of way. We left the best of the day to the last two pubs we visited. 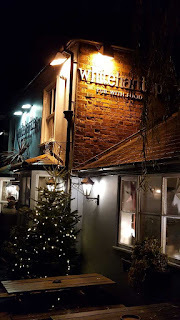 The White Hart Tap was more or less on the way back to the station and an absolute delight, though tricky to get in as the door is in front of the bar which is only about five feet away and was blocked by a number of quite pissed lads, who good naturedly stepped aside to let us in. 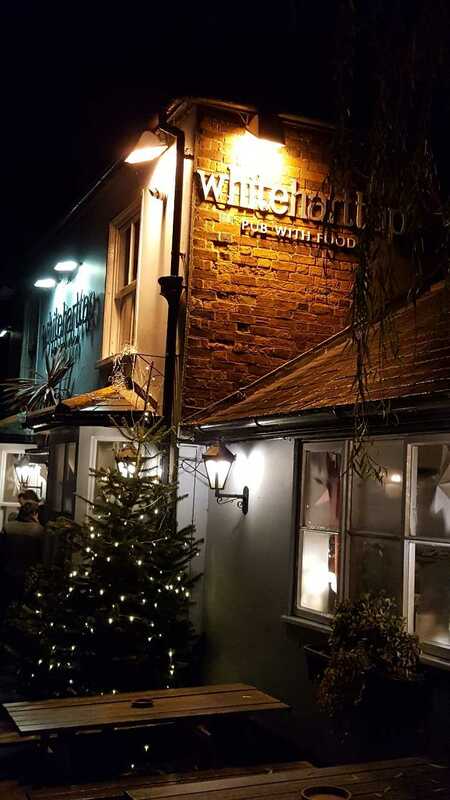 This is a neat little pub with Northern quality beer. I had some splendid beer from Summer Wine Brewery (Zenith) and even a bit of a chat with a couple of gents necking down vino reddo. Our last call was near the station. The Robin Hood was better looking on the outside than in, though it was busy and friendly. It seemed to have been given a bad taste makeover recently, with inappropriate pale laminate flooring jarring considerably, as did the light blue paint on the bar. Putting these aside, the Harvey's Best was excellent and compensated in no small way for the decor. I do wonder though about the yukky pub interior, which was further diminished by harsh white overhead lighting. This was a good day out with beer well above average, some good pubs and all noticeably friendly. Best of all in some ways was that less than an hour later, we were back in our London flat. We'll be back when it isn't raining. The city - for that is what is is - had a homely small town feel to it. Coming as I do from a small town, I liked that about it. I have been to St Albans before but it was a long time ago and I was driving, so no pubs that time. Thanks to all who gave me recommendations for this visit. I had a lovely day out last Saturday with E. In London for the Beer Writers thrash and with some spare time on our hands and the rail strikes on Southern settled, we went to Lewes for the day - a long time ambition of mine - though E had done some work for the local council there, had been several times, so would be my guide. The first surprise after a surprisingly long journey from Victoria is how steep the hill is between the station which lies below the town and the town itself. I found that out in a most unwelcome way, as my bad knee literally gave way on the one in ten gradient, or whatever this North Face of the Eiger alike, was. (It is bothering me still on stairs if nothing else.) After planting my nation's flag on the summit, we explored a bit. A long, quaint High St, dotted with individual businesses both to left and right, so on E's recommendation we went left until the town more or less ran out, noting a couple of decent pubs on the way. E explained the more modern part of the town - and that is very relative as it all was entirely delightful - was at the bottom of another steep hill, as was Harvey's Brewery. After a look at the castle - which dated back to Norman times - of course I didn't pay to go in - £17 my arse - we set off for the bottom of the town down another fearsome hill to admire the brewery and take the customary photo. Very picturesque, but a drink was required, Harvey's of course. 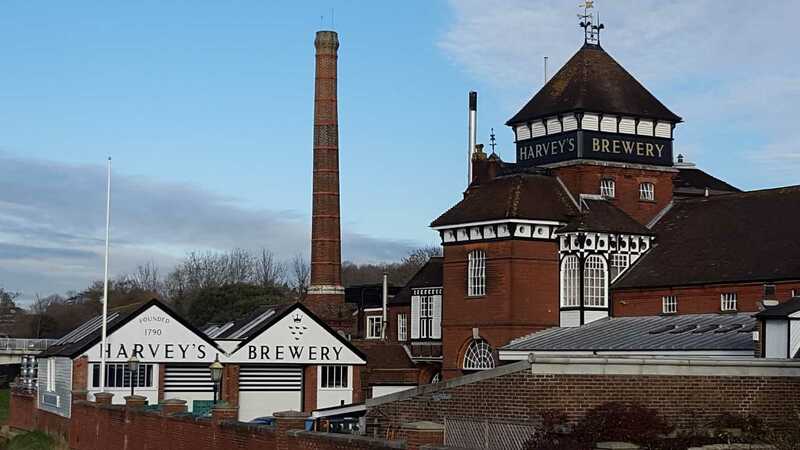 A handy sign pointed us to the equally picturesque (both in looks and setting) of the John Harvey, Harvey's Brewery Tap. That'll do very nicely. As we approached on a cold but sunny day, I noticed that the hardy outside drinkers had plastic glasses. I assumed that was because of outdoor drinking and its fleeting mark on my conscious mind was dismissed. Inside the pub is a delight. Low ceilinged, lots of wood, a bar with both hand pumped and gravity fed beer and a good buzz of conversation. I looked at the pumps. "A pint of Mild please" quoth I. Mine host, a cheerful young fellow replied "Is a plastic glass OK?" I'd rather not said I. He looked a bit embarrassed and replied that it was all plastic glasses. Hmm. Now I dislike plastic glasses intensely. I dislike even more those that are so flimsy you need to carry them with two hands. I politely declined and we left. For me it was a point of principle. Settled comfortably in the Dorset round the corner with a pint of Sussex Pale in a proper glass, we wondered what the reason could be. Now Brighton, just down the road were playing Liverpool at home and we had see the odd Brighton fan waiting for a bus or walking about, but none were in the John Harvey, which frankly was rather a posh gaff with rather a posh clientele. Surely that couldn't be it? Bloodshed, or the potential for it there, seemed highly unlikely and we hadn't seen and didn't see a single policeman in the whole time we were there. A mystery. After a bit of light shopping and a few more pubs - all of which were served in glass - we made our way to station and a last pint or two. Our destination, just across from the station was the Lansdown Arms, a proper bustling pub of character. It was heaving with returning Brighton fans, still groggy after a good hammering. We found a seat and got into conversation with two philsohical supporters of a similar age to ourselves. We asked about the John Harvey as we supped our beer, again from a proper glass. They didn't know why there was plastic either. I recommend Lewes highly. We enjoyed the Dorset, even more the eclectically decorated Snowdrop, our "tea" in the Brewer's Arms - a splendid throwback to the seventies in every way including the menu - a quick visit to the old fashioned Rights of Man and our final pints in the Lansdown Arms, but the John Harvey left a note of disappointment which still lingers. Plastic glasses in a brewery's showcase pub? I don't think so. The pubs in Lewes are old fashioned in a really good way, though I have to say that the Harveys seemed better in the Royal Oak in Borough. We bought some fancy cheese and E, a devotee of Seasalt, Cornwall, a pair of trousers. Everybody happy then. 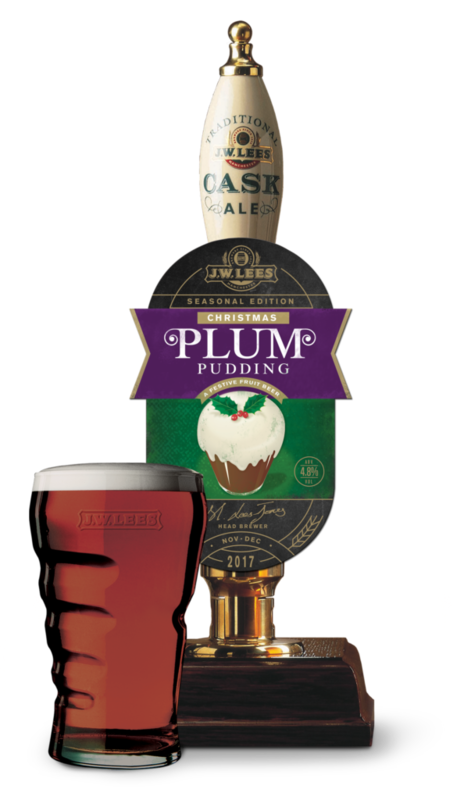 Like many a cask beer drinker, I pride myself on knowing a good pint, knowing common faults in beer and perhaps most difficult of all, knowing when a cask is about to run out. That can be a bit of a harder one though, in that the pint will often look pin bright, have a decent head and will to the usually inexperienced server, look exactly the same as any other he or she has served. But it isn't. Despite its looks the beer is actually, while not exactly undrinkable, not in optimal condition. As a beer, it has more or less ceased to be, while zombie like it still purports to be alive and kicking. In one of my local pubs last night after trying the Bitter and MPA which were excellent - they keep their beer brilliantly there - I thought I'd switch to the lovely Christmas special, Plum Pudding. It looked fine, but one sip told me it was getting to the bottom of the barrel. Dilemma. Was it bad enough to return? I debated it mentally. I know when the beer starts to lose its condition and pick up off tastes from the cask bottoms, it can still last two or three pints more, but sure as eggs is eggs, it won't last much longer and it won't be much good. An additional problem to add to my deliberations, is that they know me there and they know I'm the local CAMRA Chairman and because of that, my general rule in pubs I know, is if they know me and who I am, I don't tend to moan about the beer - unless of course it is vinegar or something equally indisputable. So, I supped a bit of it slowly while keeping my eye on the handpump. It spluttered to an end a few minutes later. I watched and waited and as soon as the cask was changed ordered a new pint. It was gorgeous. My discarded half pint or so remained on the table. Did I do the right thing in not presenting myself as some kind of beer soothsayer? I think so. In my position, you sometimes have to take one for the Campaign. Nobody likes a smartarse after all. 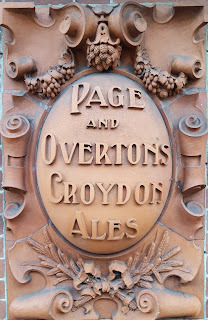 In my opinion too, which is ignored at Good Beer Guide Selection meetings, this pub should be in the Guide. Being an estate pub though very few of my members are likely to nominate it. Shows it isn't always a fix. For my London readers, very little of this applies of course. Cask beer quality there usually precludes such beery predictions.